DETROIT RUNNER....: 2 giveaways and Holiday Gift Guide for Runners with discount codes! 2 giveaways and Holiday Gift Guide for Runners with discount codes! Below are products that I have used and recommend for the runner in your life for Holiday gifts this season. There are so many running products out there. I've tried many of them. Some I have liked. Some not so much. Everything on here I like as a runner and think that anyone you know that is a runner will like as well. In addition to this, I have talked to some of the company's to see if they have any deals going to help defray the costs on these products and will list them with each item. If you have any questions at all about these products, feel free to ask a question! Hydration - There is basically two water bottles that I would recommend - one to be used before and after running/exercise/anytime and the second is to be used while running. The first is the Contigo line of water bottles. I just did a recent review of one of their bottles - The Addison(Click HERE for the full review). These bottles are high quality at a very reasonable price. They are designed well, don't leak, great quality and will help the environment. They range in prices from $10-25 so please go to their website(HERE) to check them out. Contigo has even offered to give away one of their bottles for a blog giveaway! They are giving away the Contigo 24 oz. Madison Water Bottle with AUTOSEAL. So do you want to win it? Two conditions. You must be a follower of my blog and leave a comment here(1 entry). You must either "like" Contigo on Facebook(HERE) and tell them "Detroit Runner sent me" OR follow Contigo on twitter and tweet that "Detroit Runner sent me"(HERE) and leave a comment here(1 entry). This contest will end on December 10th! You get to choose the color! I have used this bottle for two years(although I'm on my second one). I use it all year to run with at least 5 days a week and it works great, even in winter. No dripping, easy to clean, a pouch for keys, ipod, etc and very easy to use. Once you use it for a couple weeks, you don't even know you are running with it. While there are many great running belts out there, the one belt that I recommend is from iFitness. I wear the Double Pouch Belt. This has been a belt that has worked great for distances I have run up to the full marathon. It's very comfortable, does not move around and holds lots of stuff including your cell phone. I use mine to carry my keys, cell phone and nutrition when running. While I have not used the Ultimate running belt, I did have a chance to see it when I was at the Detroit Marathon expo this year. It's a great quality product and iFitness has offered one of the belts as a giveaway!!!! Same rules as above. You must be a follow of my blog and leave a comment here(1 entry). You must either "like" iFitness on Facebook(HERE) and tell them "Detroit Runner sent me" OR follow iFitness on twitter and tweet that "Detroit Runner sent me"(HERE) and send me a comment on this post and leave a comment here(1 entry). This retails for $27.95 on their website(HERE). This contest will also end on December 10th! A sweet belt for your next race! 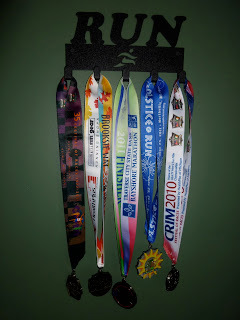 Of course, most women like jewelry so why not get your runner some jewelry related to their passion of running. You can get jewelry for both men and women at Tarma Designs(HERE). They have great designs and very reasonable prices - This item here retails for $39.98 on their website and you can read my full review HERE. Sky over at Tarma Designs has provided a discount code good for free shipping: TARMARUN This is a great product because it's one of the few you can use while you are NOT running. Haha! The first is Knucklelights(Click HERE for their website). These are lights that you hold in your hand by your knuckles. I just got these in order to do an extensive review but so far they are great. 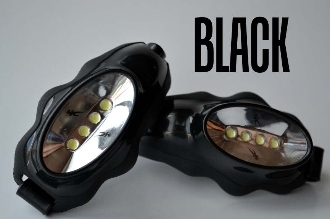 Incredibly bright and easy to use. These retail for $39.99 on their website and they also offer free shipping. You can also use the code: KL020 for an additional $5 off! More details to follow in the next week or so when I do a full review. 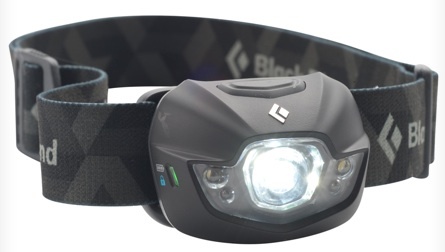 Since I've used them a few times, I am comfortable recommending them to any runner who runs at night. Another great product that every runner should have on them is identification. There are several companies that offer id bracelet that are useful. In fact, I will have a review on several in the coming weeks from Gone for a Run(Click HERE for website). I have also done a review of RoadID's Wrist ID Sport(Click HERE to read it) The ID pictured below is the 1BandID(Click HERE for website). This really is a great product. You get your information put on the ID, wrap it around your watch and forget about it. It's that simple and so comfortable. I did a review on this awhile back and that can be viewed HERE. It retails for $19.99 and worth every penny. Joe at 1BandID has offered a 15% discount code for my readers. The code: detroitrunner15 can be used until January 15. Regardless of the ID you choose to carry or buy for your runner, this is the #1 product EVERY runner should have - no exceptions! 1BandID shown - watch not included! One of the new products that I have started using this year that I recommend is wool clothing. IBEX makes some great wool clothing that is great for cold weather running. I did a review on a couple of their products awhile back(click HERE to see it) This shirt retails for $110 and is so comfortable for running. Ibex offers free shipping on any order over $75 on their website(HERE) I'm also told they will begin offering free 2-day shipping but I'm not sure when it will start. My suggestion, order now so you have it before the holiday. Ibex Zepher Sport Marino Wool Running Shirt. One of the other primary things you need when running in the winter is a winter hat. I recommend the winter beanies from Headsweats. I did a review on their Thermal Resersible Beanie a while back. This is a much needed item in a runners arsenal. Retails for $22. They also make all kinds of other hats and beanies as well. You can check them out at their website HERE. Click on Sign up on the upper right corner and you will get their newsletter that will give you discount codes in the future. Of course, if you have a serious runner in the home, they might want to know what kind of pace, distance, heart rate they have when running. If that's the case, then look into a Garmin. This little device has made it so much easier for me to run outside and know my stats. There are also other companies out there that sell watches that cover pace, distance, etc. but Garmin is the premier provider. I love my 310xt but there are less expensive options as well. Check out Garmin HERE. Prices range from $129 to $399 but sometimes if you watch on Amazon, you can get a great deal. 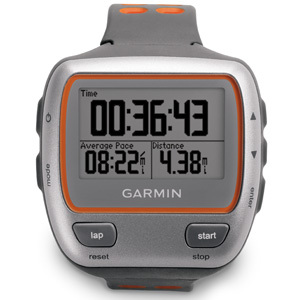 Also try Costco because they had the Garmin 405 on sale. You should also go to DC Rainmaker's blog since he does extensive research on all the watches/GPS so you can find the one best suited for your runner. I just did a review on this product. It's the Sprigs Banjees Wrist Wallet from Sprigs. 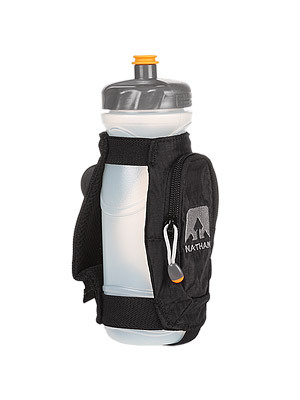 This is a really great product that helps you carry what you need on a run. Check out my full review HERE for more information. Retails for $15 to $16.50. Also, they were kind enough to give you all a coupon code: WELCOME20 to receipt 20% off your order. What a great deal. This is a great stocking stuffer for your favorite runner. You may have heard a runner you know that complained of chafing. You know, when you rub skin with skin or clothing too much and then the skin is sore. How do you prevent this? Bodyglide! Use it anywhere you chafe. I actually only use it on my feet now but used to use it all over. I rarely get any blisters since I use this product. You can get it at various stores but I usually get mine from Running Warehouse. You can see all the Bodyglide products on their website HERE. 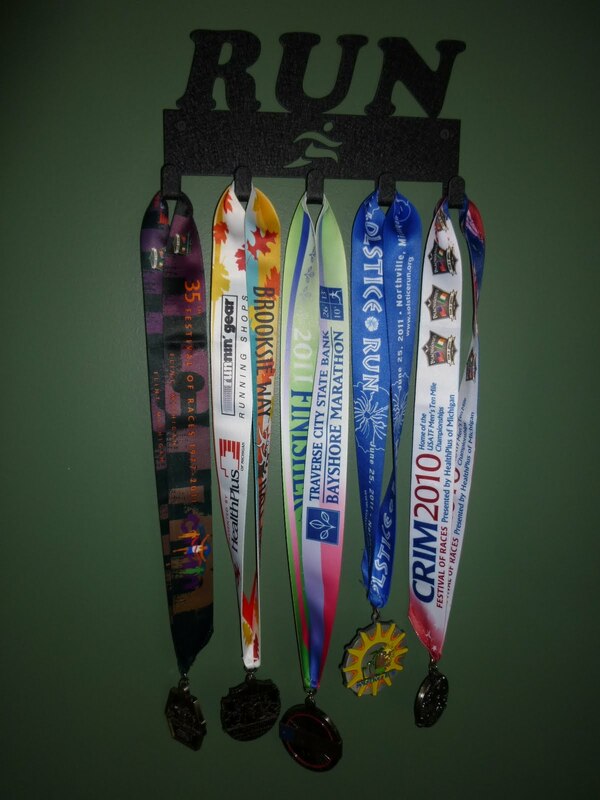 A couple months ago I did a review on a medal holder from Sport Hooks to hang your race medals. Click HERE to see the full review. They have so many to pick from and your runner would be really excited to get one of these babies for a gift. There are also other companies that make these as well but I'm only familiar with this one. You could also make one yourself too(which I did) but it wouldn't be as cool as these. Check out their website HERE. Retails from $19 to $65. Shoes are a big one for runners especially if you're runner is running marathons. They will go through lots of shoes. If you know what your runner always runs in, then you could buy them online or at your local running store. If you are not sure, do NOT buy them. A gift certificate might be a better way to go for this. Shoes are a very personal thing and your runner wants to be able to be comfortable in these for 400+ miles so don't just buy any pair. Personally, I like Saucony. Click HERE for their website. 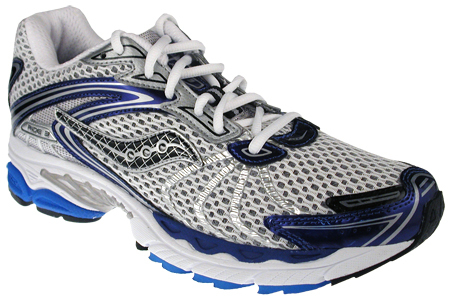 Shoes can run anywhere from $50 to $225 depending on the brand. I love my Saucony Ride! Finally, my last recommendation is for that really "hard to buy for" runner. It's a gift certificate to Running Warehouse. Click HERE for their website. I buy probably 70% of my stuff from them now and wish I had found them sooner. This company is incredible. Free two day shipping. Free return shipping. Great prices. Easy to work with. Huge inventory variety. If your runner can't find something here to buy, then I'm not sure where they can go! Running Warehouse does an awesome job! You can get all amounts of gift cards at their site. In addition, for sale items only, if you "like" them on Facebook, they have a code for 15% off currently. So there you have it. Sorry this was so long! I hope you find it useful and can find something for the runner in your life. I've tried to touch on many areas and price ranges so you can find something. Good luck on the giveaways!!!! * Note - I have put this product list together on my own and none of the companies listed asked for me to do this, recommend their product or give a positive review. The previous reviews I have done on some of these products, I received the item in exchange for a review of it. I liked Contigo on Facebook, and told them you sent me. I follow your blog. Thankyou for all the reviews you do. Im VERY new to running, and they are very very helpful! LIked ifitness on facebook, and told them you sent me.! Thanks for the chance to win the belt. I follow your blog. Thanks for the link to the Nathan Handheld. That's a way better price than I've found and it's time to buy one. I need to look into the beanie, its actually starting to get cold down here in the South again! Saucony are the only shoes I wear! I like Contigo on FB and told them you sent me. Wow! Great job putting all of these reviews together in one place! you've got some great relationships going on out there. Great reviews! I started following iFitness belt on twitter and told the you sent me! I also like iFitness on FB and told them you sent me! me me, pick me, for the ifitness belt!! I followed ifitness on twitter AND told them you sent me!! I follow Contigo on twitter and tweeted at them! I follow your blog. Thanks for the bottle recommendations. I am a Detroit Runner follower. Totally need a new water bottle for the gym. Still following. :o) Love the iFitness belt. Those things are like fannypacks but more discrete. Ha. I liked Contigo on FB and told them you sent me. I like ifitness on FB and told them you sent me. I folow your blog. Thanks for all the reviews. Although I never comment, I do read all the time. I entered for the fitness belt and liked them on facebook. I like your blog too! I also entered for the water bottle and liked Contigo on Facebook. I really admire how you run in all crazy weather and in the dark. I think I'm switching to the treadmill more until the spring. I also live in the Detroit area. I'm a follower and can't believe the depth of this post. Love it!